A comedy slice of life anime similar to Lucky Star and Azumanga Daioh, there are plenty of funny, awkward, silly, and random moments to keep you entertained throughout the entire series. Simply put, this anime is quite random indeed. So random that is is just plain silly at times to be even trying to comprehend what is going on. 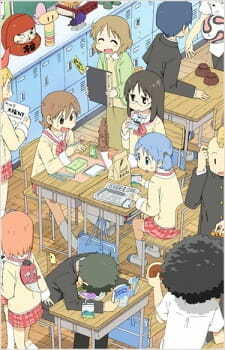 Much like the story of Lucky Star and Azumanga Daioh, Nichijou is about the daily lives of a bunch of high school girls. The anime totally contradicts to what the title suggests as "ordinary life". You got this strange school where so many random things happen that is just gets so silly at times you fall back laughing quite hard. Of course, there are also awkward moments that portrays the silly moments in real life that is quite amusing indeed. Anyhow, when you first start off, the anime seems to be quite dry and boring as the totally random events that happen will take you by complete surprise. The second half however, got more interesting as the characters are more fully developed and interact with each other more. That said, if you could handle Lucky Star and Azumanga Daioh, then you will be able to handle this anime. The art was rather plain and simple from the beginning which is like a comic book. Some transitions did have some high detailed artwork, but that was just to portray the change in time of day. However, I loved the overly emphasized use of typical anime responses and facial expressions. The characters all had a cute "chibi" form that was just hilarious to watch. The theme songs were just catchy and just totally peppy and lively to listen to. It suited the anime really well. Although the chosen actors are not well known, their representations of the characters was just perfect in every way. Much expected for a comedic slice of life anime. Background music for most scenes were noticeably reused throughout the series so there was some lack of variety; but then, the music does give us a familiar feel to when something funny and random is about to happen. The characters were all cute and "chibi" style. They were pretty generic though, as if they had been taken from other anime. That aside, there is really little development of characters of the anime, so the story rather focuses on the everyday life of these characters. That being said, the anime is strictly a comedic slice of life anime, so there is really little point in seriously developing characters if they are just going to do silly things. The episodes were all split into several parts; with each part portraying a different character's scene. It was good that the producers did not mash all the parts together to form one whole single episode which would have made the anime rather hard to watch. As each part had little correlation with each other, it was pleasing to quickly get the punchline at the end of each part. There were also some random mini side-stories that will keep you occupied even though they do not relate to the anime at all. Overall, it was enjoyable to watch as the series progressed. There were some laughs and some "what!?" moments, it all depends if you have a huge sense of humour or not if you will enjoy this anime. At first is was quite random and silly, but towards the end I got used to the chaos. I would say that the art was pretty plain and simple compared to your average anime, but I loved the exaggeration of facial expressions and actions of the characters. Theme songs were quite catchy and voice acting was perfect despite the use of unknown voice actors. The characters were rather generic, but their interactions with each other was eventfully interesting indeed. Somehow, this anime can't be said to be the same as Lucky Star, so it's enjoable in its own unique way.